For as little as 4 quarters you could win a $100 prize! 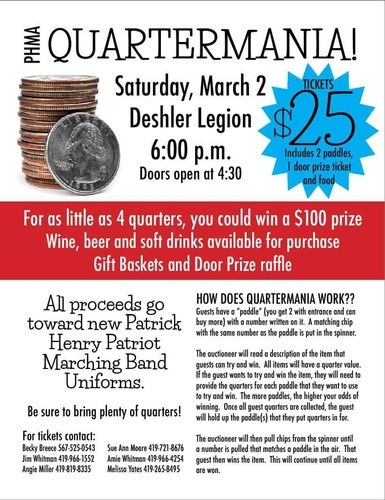 Join us for a fun evening where you could win prizes for only quarters while helping us raise money for new PH Patriot Marching Band Uniforms! Contact any of the people listed on the flyer for tickets. A limited amount are available! Tickets are $25. You get 2 paddles, 1 door prize ticket and food. Additional paddles, beer, wine, soft drinks, and jello & pudding shots will be available for purchase.